So if you’re following the Indian gaming market, you know that Microsoft’s Xbox One isn’t doing so well in India and it’s competitor, the PlayStation 4, has been destroying it over here. In the last few days, Xbox One has been making a slow and steady comeback after their disastrous initial launch at E3 and their Amazon exclusivity deal in India which gave Sony a clear lead in the Indian market without the latter putting in much effort. But overall, a rather bleak future awaits the Xbox One in India if things go the way they’re going. 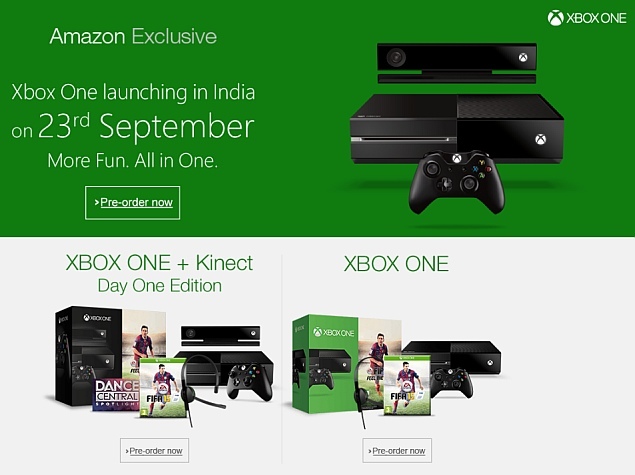 Amazon India is losing it’s Xbox One exclusivity deal from this month onwards but the damage is already done. According to reports, Xbox One sales have been low in India from the very beginning and why wouldn’t it be? Retailers vehemently opposed Microsoft’s move to make the Xbox One exclusive to Amazon from the very beginning. With the Xbox One having an online only presence, it’s bad marketing (which we’ll get to in a later point) and the fact that it didn’t have any offline exposure in the entire country since it’s launch for the most part, it’s easy to see how the console went under most people’s radar. It should also be noted that while ecommerce is growing rapidly in our country, studies suggest that quite a lot of people use ecommerce websites like Flipkart and Amazon only to check the products before buying them offline. And I’m guessing the reverse would be true as well since I personally tend to go check out products offline and order them online if I like them. I mean, I can do half the things shown in the ad on my PC and the other half, like playing the games via the Xbox One while my mom watches her Hindi serials I so abhor on the same TV, is probably the last thing I’ll do in my life. The Xbox One India marketing team has absolutely zero idea on how to sell their own product because if they did, they’d at least make AIB put up the ad they made on their own channel, but they didn’t! ಠ_ಠ They didn’t even bother making use of or replicating the whole let’s play culture that’s growing like crazy in the west with AIB, instead, they made this. Microsoft has been so desperate over the years that they tried to ask their student partners for help in order to sell more Xbox One’s across the country. If only they gave one of those student partners some YouTubing(?) tutorial and tried to build a community using the platform but nope… why would they do something as logical as that? At this year’s Gamescom, we saw the true capabilities of the Xbox One when Microsoft showcased their latest exclusive, Crackdown 3. As anyone who lives in India would know, we don’t exactly have the best internet in this country and while people are speculating that you will need an internet connection as low as 400 kbps to play Crackdown 3 to it’s full potential using the cloud, the problem isn’t speed, it’s the latency. Latency is one of the biggest issues faced by online gamers in India since most online servers for games are located far away from our country. It’ll be interesting to see how many people are able to leverage the Xbox One’s cloud computing technology in general but I very much doubt most Indian gamers will be able to do so because of our pathetic internet infrastructure. It should also be noted that while India has the 3rd largest base of internet users in the world, most people in India connect to the internet using their cellphones. As is evident by the rather large community of Dota 2 and CS: GO players over here, India is a very PC centric country similar to China. And it’s not just me saying that, the Business Head at Nvidia South Asia, Nikhil Kohli in an interview with NDTV Gadgets mentioned 2 years back that, “the Indian PC gaming market is currently made up of roughly 14 million gamers.” However, most gamers here are pirates and cannot afford games, let alone an approximately Rs 35,000 console that doesn’t have a lot of exclusives that’ll take your breath away unlike the Playstation 4. Also taking into account that PC retail games in India in general are very cheap compared to their digital or console counterparts, PC gaming is the way to go in our country where most people still see gaming as a luxury. If there is such a thing as console war, even though Microsoft technically cannot lose since the Xbox One is doing better than it’s predecessor and it’s a gigantic corporation with a lot of money, the Playstation 4 is winning compared to the Xbox One. Not only in terms of global sales but also because the Playstation 4 has more exclusive games and more games in general (Not taking into account Xbox One’s backward compatible games.) Let’s face it, the Xbox One at the end of the day is a gaming console and hence gamers are it’s main target audience, and if they don’t buy it, no one else will either. Plus once the 1TB version of Playstation 4 arrives in India, the 500 GB one will probably get a price cut which means that people will even have less reasons to buy the Xbox One in India. While there are no official reports detailing the number of Xbox Ones sold across India since Microsoft will never go on record to say it out loud, industry veterans have told me that (Yes, I’ve gaming industry veteran contacts flexes arm) the Xbox One has sold about 1500 units last December and has probably sold around 2000-2500 units till now while the Playstation 4 has about 50,000-60,000 units circulating in India, according to PlayStation India head Atindriya Bose, and will have about 100,000 units by April 2016. Microsoft has a rather steep uphill battle to fight if they want they want a good future for the Xbox One in India but as I’ve said in the beginning of my article, if they keep heading the way they are right now… well, let’s just say that it’s a good thing that Microsoft owns Windows as well since the PC gaming market is pretty big over here. Previous articleIs Money Really The Reason Why Piracy Is So Popular In India? Next articleTwitch Vs YouTube Gaming – Who Is Winning?